While many cities nationwide are seeing declines in bus ridership, a few transit agencies – including ours here in Seattle – are bucking the trend by restructuring their routes to focus on frequency and span-of-service, beyond just 1-seat rush hour rides into downtown. With a major restructure on the books for a year now, you can add Pierce Transit to that trend. PT, was one of the agencies hardest hit by the Great Recession, has been climbing out of a hole. A broad restructure (the first in the system’s 40 year history), which brought a sensible grid network and increased frequency to the Tacoma-area bus network, was proposed in the fall of 2016 and went into effect in the spring of 2017. With a restructured network and 59,000 additional service hours, PT announced this week that ridership is up 3.8% in 2018 versus the same (pre-restructure) first quarter of 2017. “The restructures around northside, eastside, and Lakewood routes trimmed redundancy, eliminated some inefficiencies, and overall are resulting in more direct service for where passengers want to go,” Peter Stackpole, PT’s Service Planning Assistant Manager, told me via e-mail. While the increased service hours no doubt helped ridership, it was the mixture of more hours and a better network that put ridership over the top, he told me. As an example, Stackpole pointed at Route 42, which saw huge ridership gains not only on weekdays (where service was increased) but also on weekends (where it wasn’t). As the network as a whole gets more useful, it draws in more riders, which is exactly what you’d expect. While the restructure indeed may have significantly improved service, it still leaves a lot to be desired. For example, Route 13, which links quickly growing Proctor, Old Town, Downtown, and the Tacoma Dome, only runs on 1 hour headways, and its last trip is before 7 pm. This is hardly a useful route. Just eliminate it. 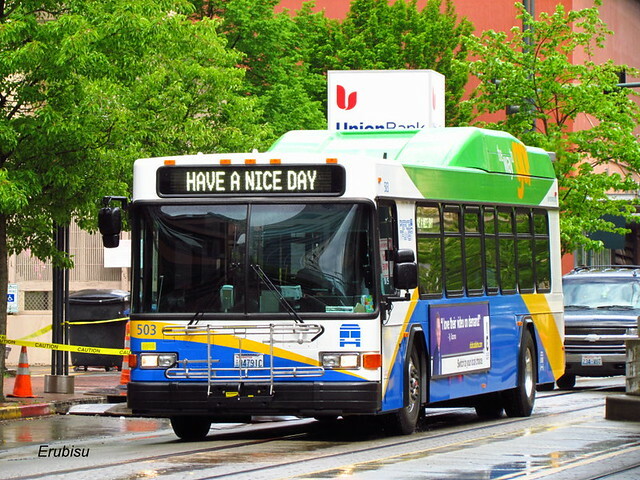 Nearby Route 16 runs on 30 minute headways to connect Tacoma Community College, Pearl, Proctor, Stadium, and Downtown, stopping short of the Dome. It goes until nearly 9 pm, a little better, but requires a transfer to another local route if, for example, you are taking the Sounder to Seattle or the 574 to the Airport. Route 57. That you need to take a look at! Check out the routing map of this thing. It looks like the route traveled by a lost tourist who keeps making wrong turns. How is this useful to anybody? We can’t have routes that weave back and forth through neighborhoods taking unnecessary time to get people to their destinations and expect people to use it. In case you’re wondering, it seems that PT is trying to create a “shopping route of sorts.” It starts at the Tacoma Mall, passes the Costco, Target, Walmart, Allenmore Hospital, then deviates south for some unknown reason through a neighborhood, then turns north to pass St. Joe, before terminating downtown. So, in case you can time out your surgery, Walmart & Costco runs, trip to the mall, and manage to fit it all on the bus, and happen to live near S 25th St or somewhere downtown, this is the route for you. Otherwise, I fail to understand the utility and will just ride my bicycle. The restructure was badly needed, but I would argue that further prioritization and restructuring is needed if there aren’t funds in the foreseeable future to make the improved routes actually function for people who might use them to get to or from work or appointments. When planning a service restructure, you first map out the network you would like to have. Then, when you present it for public comment, you inevitably get complaints about this or that random destination which is a further walk to the bus than before, or this or that random trip pair, which used to be a one-seat ride and now requires a transfer. Often, the best way to get the restructure through the political process, while minimizing the damage to most riders’ mobility is to pick *one* route to be the sacrificial lamb and address every complaint – at least on paper. The idea is that if you take the *spread the pain* approach, give one route a deviation to destination X, another a deviation to destination Y, another to destination Z, etc., then all riders are made to suffer a deviation to somewhere, and system ridership suffers accordingly. But, if you create *one* new route to do all the deviations, in exchange for having one route that nobody rides, you spare the people on all the other routes, thereby getting more ridership on those. Of course, the sacrifice route is run with minimal span and frequency, since expected to generate very low ridership from the beginning, and you don’t want to sink much money into it. Later (e.g. when a recession strikes) the sacrifice route can be cut, altogether, due to low ridership, so it’s not really an indefinite commitment, just a few years. To put it another way, you lose fewer riders if you add deviations to a route that already has negligible ridership to begin with, than a route that’s popular to begin with. The original restructure plan called for cutting Route 13, but commissioners stepped in to save it due to constituent feedback. But it’s the exception that proves the rule: it’s the only route that lost ridership in the restructure. I work right on Route 13 – its problem is the hourly service. I’ve trugged up the hill to catch 16 several times and saved some 40 minutes doing so. The North End of Tacoma will be a critical voting bloc when PT decides to go back to the ballot again; there are rumblings about 2020. Route 13 isn’t the poster child for efficiency, but I have seen worse projects started at PT prior and since the restructure. The route along Ruston Way is basically inaccessible. It’s good to have something serve Ruston Way, but other than at Old Town there is no physical way to get from areas along the 13 to Ruston Way. My though on 57 is that it’s going away with the Tacoma Link extension in a couple years, so they’ll rework it then. Route 57 used to be somewhat more direct but when the combined the 27 and 200. the opted to make the 57 Weave through Hilltop (incredibly low income area that needs better bus service) and have the Trunk route 2 be more direct. I feel the when they Extend LINk to TCC you will see route 57 become more direct. The Pierce drivers on the 574 make that route first leg of my preferred trip to Seattle, via LINK from Sea-Tac. 594 tends to spend too much time stuck in traffic around Spokane Street. Excellent coach-handling across three lanes of heavy traffic to their right between Federal Way P&R and Star Lake freeway station, first of two. Shame how “Interagency” translates as “spite and complexity.” Dave Turissini, if you’re reading this, prove it by just doing it! White PT operates route 574, the ST Board has final say over its routing. Metro seems to have a bottleneck training operators, which is forcing workarounds, like contracting to other operators (just like ST does) to operate more and more routes, which get designated as DART routes. That might mean more work for PT drivers, and more use of PT buses and base space. Does PT have space to store more buses? Pretty soon, PT and CT (via First Transit) may be operating the entirety of ST Express service, as well as Link. We could use some double-talls on some of the eastside routes. Route 574 may work as a preferred option going north to Seattle, but coming south, the connection means waiting at SeaTac Airport Station and then riding around 7 minutes to the south airport terminal. When I want to take 574 south, I really wish ST had gone through with its proposal to re-route route 574 to Angle Lake Station. I hope it comes up again when Metro route 180 gets a frequency bump. The ST Board seems a lot more conservative/timid now than the PT Board, in terms of transit planning. So, any progress has to be made by getting staff to set the most pro-ridership default before needing the board’s permission to undo a sub-optimal default. Heck, we can’t even get that awesome 591 route that was proposed from Tacoma to South Lake Union. It is desperately needed, but … politics. Metro made some of its toughest and most productive decisions back when there were four Republicans on the county council. I don’t think this county council would have gotten rid of the scourge of pay-after-you-shove-to-the-exit. Nice snark, but pay as you exit works very well except at transfer points or other big activity centers. 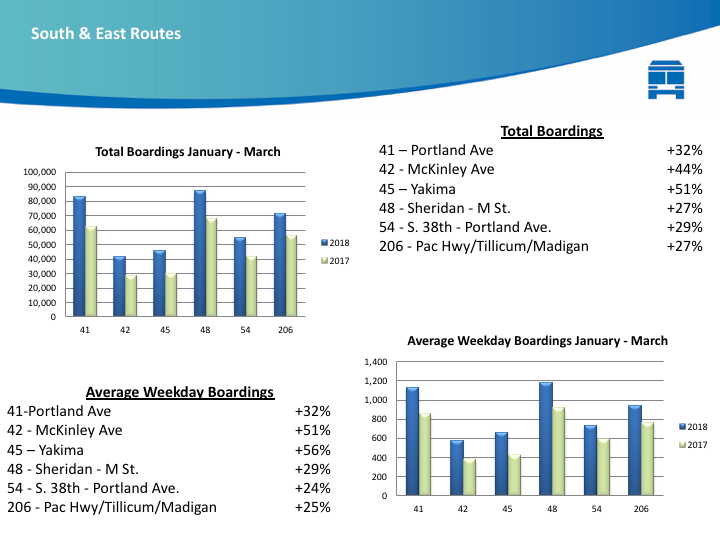 On most routes the vast majority of stops have one or two deboardings. The first person almost always would have paid by the time the bus came to rest. Compared to the two and a half minute dwells downtown it was far more efficient. Wad it confusing? Yes. But for a bus of regular riders it sped things up. Have to check more carefully- but I think the 574 comes in from the south, stops at the bridge and then at south end of the terminal, and waits out of service ’til departure time. Where, not exactly sure. Then, starts Lakewood trip at the bridge, swings into the terminal again, and then heads south on its run to Federal Way, Tacoma Dome, SR 512 P&R,and its Lakewood Town Center terminal. Unfortunately necessitating a cautionary ten dollar cab ride to get my car. I’d really like to see express service between Olympia and the airport, with one stop at Tacoma Dome. On half hour headway. Almost fed up enough with LINK tap-crap to wish the 194 was back. Except would have to have trolley poles.Though bet one of those pantographs they’ve got on Swedish trucks would work. If we gave the legislature employee ORCA cards, might make that body see some utility in our existence. Maybe we could have the card read “Seniority” instead of “Senior.” Though truth in advertising might mandate “Senile.” At least applied to governing ideas across party lines. Since you can be in the legislature at 18, would be great to include both a high school diploma, and an oath of office along with the adult ORCA card. Couple new legislators getting nailed for mis-tap might get ST’s funding shut off long enough to teach it some manners. My brother’s had that happen twice in a week. Second time, though, fare inspector realized he’d been to the ball game, and gave him an All-Day paper pass. Sounds suspiciously like “Paper covers rock” or scissors or whatever. Except if you get it wrong, you still don’t get fined. Which only happens with pre-paid plastic. The Seattle Art Museum might find a slot in the next public art project using the Federal 1% to see their people dressed like Michelangelo lying on their backs on pallets under the station roof at the Airport, painting the fare policy on the ceiling, since the walls and the floor will all be full. Some years back I did a trip from Seattle to Tacoma via Vashon Island and the water taxi. With the new Ruston Way route this could be a bit faster now. The part that seemed to take forever was the local 11 from Point Defiance to downtown Tacoma. Might be good place for ferry, fast or otherwise, from Downtown Tacoma. But also, could be room in the BN right of way beside the tracks for a streetcar line. Ferry from downtown Tacoma probably never makes sense because it’s a short distance to Tacoma Dome and then onwards to either Sounder or Express buses. A ferry+Vashon bus+ferry commute probably only makes sense for people trying to get to Seattle from Ruston or northern-ish Tacoma.. If I lived in Ruston, rather than agitating from a 1-seat ferry ride from Point Defiance, I’d lobby for an express bus through Vashon that’s timed with the ferries on both ends. I’ve done that ride as a scenic route to Point Defiance Park – would not recommend it for an everyday commute – schedules are too erratic, and four ferry rides a day every day would be quit expensive. Still, it’s an absolutely great way to visit the park on a recreation trip, and I highly recommend it. For more fun and exercise, you can bring a bike a pedal the trek across Vashon Island (warning – it’s very hilly). When I made the trip it was about 10 years ago, and the walk-on ferry tickets were quite a bit cheaper. AJ, if I lived in Ruston, I’d just ride my bicycle to work. If I got forced into a job in Seattle, my preference would be for a local bus route to the Tacoma Dome, so I could take the Sounder, although I wouldn’t lobby for it. I’d be too busy trying to either find work in Tacoma, or find a home closer to work. We need to end the trend of extreme commuting. Step 1 is for businesses to base where their employees can afford, Step 2 is to build more housing where the shortages exist. Tacoma existing as a bedroom community for Seattle doesn’t make sense. There’s plenty of land in Seattle to build the housing that is needed to match the demand. And, there’s plenty of land in the ‘burbs to accommodate some level of business “migration” away from Seattle. I’d say a strategy of both is highly necessary. isn’t 59,000 new service hours close to a 10% increase. While a 3.9% increase in ridership is nice, it doesn’t sound that great in this context. Isn’t the whole point of a restructure like this to reduce the cost per boarding? The point of a restructure is to serve a larger cross-section of the community’s total trips. Sometimes that means adding runs on high-volume corridors. Other times it means serving a wider variety of income levels or more types of trips (i.e., to different kinds of destinations), or to improve transfers to other transit modes. Have to consider this as an improvement on the nation-wide “background” of falling ridership, whatever reasons are behind it, which increasing VMT, congestion, bus traffic delays are no doubt a huge factor. 2% population growth in Pierce County probably didn’t hurt any. Who is asleep at the switch at Metro? The ridership data page needs updating STAT! In general, when service is added, ridership goes up, but often not as fast as the growth in hours. It can take awhile for the riders to find the routes. An increase in bus system ridership is pretty good these days.